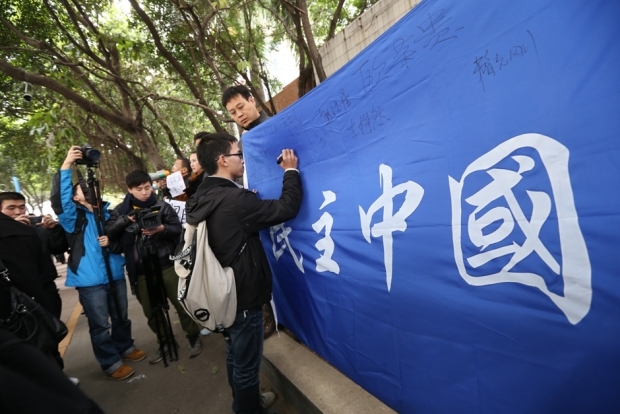 A man signs his name on a giant banner that reads “Democratic China” outside the headquarters of Nanfang Media Group, publishers of the Southern Weekly newspaper, in Guangzhou, January 9, 2013. Protestors gathered in support of the newspaper’s editors after an editorial they wrote was heavily censored by the propaganda office. 2013 began dramatically in China with a standoff between journalists and state propaganda authorities over a drastically rewritten New Year’s editorial at the Southern Weekly newspaper. In the first week of the New Year, the editors of Southern Weekly, a weekly newspaper in China’s Guangdong province, staged a high-profile protest against the provincial propaganda authorities’ meddling with its emblematic New Year’s Greeting. The paper is known in China for its liberal and progressive stance. The incident began with the drafting of the New Year’s issue in the last week of 2012. The original essay, drafted by senior editor Dai Zhiyong, was entitled “China’s Dream, the Dream of Constitutionalism.” The piece was apparently submitted on December 29 to the chief editor Huang Can, who was reportedly unhappy with its liberal tone and ordered it to be redrafted internally. The revised draft, entitled “We Are Closer to Our Dream Than Ever Before,” was cut down from 2,000 to 1,000 words and submitted to the propaganda authorities on December 31. Later that night the propaganda authorities came back suggesting major changes and the removal of two other articles. In the early hours of January 1, 2013, Huang conveyed further instructions from the propaganda authorities. The headline was to be changed to “Homeland Dreams.” The draft was signed off on by senior editors, who then left work with their mobile phones turned off. Overnight, the chief and deputy editors were summoned to the provincial propaganda office and ordered to make further changes. It remains unclear who finalized the text, but none of the senior editors were informed of the revisions before publication. Not only did it include elementary mistakes, but the title of the revised issue was changed to “Seeking Dreams.” The tone of the issue was radically changed from liberal reformist to party propagandist. The crudeness of the censorship, and the outspoken protests, attracted world-wide attention. In an example of the power of the Internet, a PDF version of the original was posted online, side by side with the final published version. We cannot be absolutely sure which stage of the original was posted here, but it was reposted on highly reputable websites including China Digital Times, with excellent analysis from the China Media Project at Hong Kong University. Chinese-speakers at Oxford University have translated both versions into English, so you can see for yourself what message the Guangzhou censorship and propaganda authorities did not want Chinese readers (and the world) to hear—and the deathless prose which they substituted for it. The translations are not perfectly polished, but should give you a good idea of what was being said. Note that the penultimate sentence of the original—“One word of truth outweighs the whole world”—is an unacknowledged quotation of the Russian proverb which was central to Alexander Solzhenitsyn’s Nobel Prize Lecture, entitled “One Word of Truth.” This sentence was also subsequently tweeted on Sina Weibo by actress Yao Chen, together with the Southern Weekly logo. She has over 38 million Sina Weibo followers. We look forward to the growth of the constitution and the birth of a constitutional government. Only by this can we achieve the tortuous transformation of this ancient nation. Only by this can our nation and people stand again on solid ground. Today is the day China becomes able to dream. Today is also the day we can realize our dreams. We experienced the nightmare of the Cultural Revolution when the constitution was absent, and it took us more than thirty years to return to rationality and common sense. From the household responsibility system to the creation of the self-employed, township enterprises, and private enterprises, we have experienced the partial return of rights for people to arrange their own lives autonomously. We have then created a prosperous city—hoarded with good harvest of food. Around 170 years ago, we began to wake up from the nation’s illusory dream. We suffered a defeat by the British and then another defeat by the Japanese. People lived in growing miseries. The feeling of shame penetrated the heart of the Chinese gentry. Defend the nation! Defend the diversity of the race! We traveled from self-strengthening to constitutional monarchy, from the constitutional establishment to the revolution. Then the angry masses hesitated no longer to remove the fetters of Confucianism in the form of objects, system, and culture, and they decided with no mercy to uproot their civilization thoroughly. After the 1911 revolution, the Qing emperor abdicated, and our ancestors finally built the first republic in Asia. But a free, democratic, and strong Chinese constitutional government did not follow. At one time, people were distanced from benevolence, righteousness, and the ways of heaven. They were distanced from the commitment to freedom. Despite the misfortunes of life, and despite the darkness of humanity, we remain people who can still dream, because we all have a heart to dream. Today, we dream not only of material wealth; we dream also of the enrichment of our soul. We dream not only of stronger state power; we dream also of the dignity of the people. Between renewing the people and renewing the nation, between salvation and enlightenment, none can do without another and none can override another. And constitutionalism is the foundation of this beautiful dream. Enact constitutionalism and defend our rights, so that the hearts of all can shine like a moon over clear waters; so that the widowed and the needy can feel the warmth in the winter chill and shield them from shivering, so that the “City Management” officers and hawkers talk lightheartedly like friends; so that homes can become the safe bulwark for our families. Enact the grand dream of constitutionalism so that everyone can fulfill his or her own dreams. And this requires us to act right now with our hands, to protect our current livelihoods rather than leaving this important responsibility to our grandchildren. Celebrate your dream, and make an effort for the dream of this nation. This is the dream of many of those in the journalistic industry, their modest ambition. They are loyal to journalism and even more so to their soul. May you also have a rosy dream. May you pursue your own goals with freedom and complete what Heaven has endowed you with. Always dream that a civilization of five thousand years perpetually renews itself to improve the modernity of human beings, and to proffer humanity a sweet, flowing spring. We must reflect on the wisdom of our predecessors to realize our dream, to mediate with their beliefs, customs, and sentiments. Confucianism, Buddhism, Daoism, Legalism, and Mohism, all of them are sources of inspiration. Zhou, Han, Tang, Song, and Ming, every dynasty offers learning. This is by no means simply to restore tradition. Ancient sages cannot give all that is required today. Let us not disparage our predecessors easily but calmly absorb, transform, and progress, so that the Chinese civilization can blossom and bear new fruits. Lessons from the world must be learned to realize our dreams. We must earnestly assess the democracy of the Greeks, the laws of the Romans. We must learn from British and American constitutionalism and catch up with modern technology and civilization. Yet, this is not to say we should simply learn from Western civilization like obedient students. The West has progressed through its own tracks. These tracks may not be able to provide us with what we need today. We stand on our land, together with people from other nations, to merge the old ways of living into a new livelihood and to create a new civilization by combining the East and the West. We have to comply with the common values of mankind from the ancient and the modern, the East and the West, but at the same time we must not fear to make new dreams. Praise our predecessors and compliment our neighbors, not because they are perfect but because we recognize the familiar happiness in their eyes, the flow of freedom that lies in their hearts. Only under a constitutional government can our nation and our people continue to grow strong and prosperous. Only under a constitutional government can we fulfill the dream of constitutionalism. Only after realizing the constitutional dream can we speak of safeguarding our sovereignty and protecting our civil rights and freedoms. Then the freedom of the state will come down to the freedom of the people, and come down to a time when people can speak their own minds and dream with their hearts. Is there anyone born who has no affection for freedom? This freedom is not expressed merely in terms of rights against authority. It is also for the sake of forgiveness, wisdom, benevolence, and virtue—against vengeance, ignorance, cruelty, and vice. There are still people willing to listen to your dreams and expecting that you dare to dream. They will cheer for you when you stand up to harsh times. Whether you experience the cold of humanity or enjoy a wonderful life—they will cheer you. They have nothing to capitalize on, except the pursuit of promises. They are good at nothing, except their persistence for the truth. One word of truth outweighs the whole world. One dream can make life shine with flying colors! This is the one thousand and fifty-seventh time we meet, and our first encounter in 2013. In the past, present, and future, we will stand tall to protect this newspaper, at a time when you stand tall to protect your own livelihoods. Let us bless each other, and hope that we shall move closer to our dream in the brand new year. Dreams are a form of self-promise and have to be revisited from time to time. We have created a spectacular kingdom that has lived on for thousands of years. But the old dream was suddenly awakened from its sleep by the gunfire in 1840. This led us to realize our mistakes from yesterday. We opened our eyes to see the world, to trumpet our efforts, to witness the intelligence of the masses, and to renew our morals. Our reform and restoration started from here. Our republic and revolution started from here. Our cries in the May Fourth Movement also started from here. Our imagination and ideas on the boat in Nanhu (South Lake), our proclamation on Tiananmen, and our horns that signal Reform and Opening, all started from here. Our promises to ourselves can never be separated from the progress of the era. As the old saying goes, “if you can renew yourself for a day, do so from day to day.” Only by integration into the progress of civilization can promises save themselves from degenerating into shackles. Towards the end of 2012, flames of our dream have once again been ignited. Xi Jinping, the newly appointed general secretary of the CCP Central Committee, said: “To achieve the rejuvenation of the Chinese nation is the greatest dream of the Chinese nation in modern times.” This dream, embodying the strength and striving of many people, inherited our nation’s ideal of “Family, Country, and the World.” This reflects China’s confident road towards the future, towards a confident theoretical foundation, and towards a confident system encompassing the overall interests of the Chinese nation and people. This is the common wish of all sons and daughters of the Chinese nation. We are closer than ever to this dream, because “the life of a consitution lies in implementation and its authority also lies in its implementation,” and because the constitution is the contract our nation signed to symbolize the dreams of our people. We are closer than ever to this dream because we have reached the era in which we can realize our dreams. It is a dream in which we want rights to be realized, and in which we want justice to flow. It is a dream in which our state will become strong to protect our people, and will let everyone receive what they deserve from our national development. Let us realize our hundreds of thousands of dreams so that we can pay homage to the countless souls who have sacrificed their brave lives. Let us realize our hundreds of millions of dreams so that we can exorcise the excruciating pain from the past century. The better side of things is in the establishment of a new China when we “stood up to the world,” the era of Reform and Opening when we “got rich,” and in the new century when we “became ever stronger.” Our dream is gradually turning into reality. These translations were first published at Free Speech Debate at Oxford University.